You can find Urban Krag on the corner of Cass and Clay Streets in Dayton, Ohio. On the corner of Cass and Clay Streets in the Dayton, Ohio suburb known as the Oregon Historic District, sits one of the most unique examples of the neighborhood’s revitalization efforts following its post-World War II decline. From first glance the building looks like a church—and it was. Built in 1888, the brick church features Romanesque rounded arches, Gothic windows filled with stained glass, and a squat tower that faces the corner where the streets intersect. The sign hanging from the building’s entrance identifies it not as belonging to a specific congregation, but as the location of Urban Krag, a rock-climbing facility. A fourth-generation Daytonian, Karl Williamson was walking along the Oregon District in 1994 when he came across the dilapidated church. 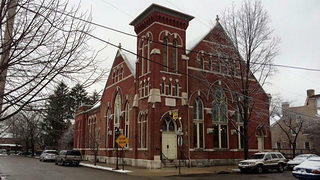 The congregation had long moved out of it, and it had been vacant for about 30 years. 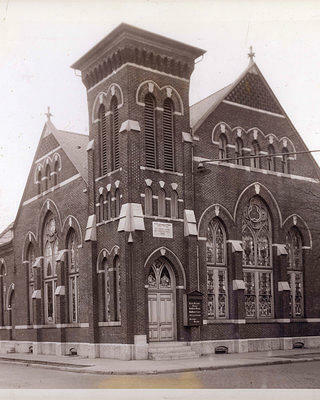 Considered a blight in the neighborhood, the town had plans to tear the church down. Williamson, who had been planning a rock-climbing business for about eight months prior, formed an idea as he considered the building’s soaring ceilings and open interior. He called a friend who was a realtor, who identified the property’s owner. Soon, negotiations were underway for purchasing the property. Because the church was in a residential area, Williamson had to apply for numerous permits to allow it to be used for commercial purposes. After almost a year, Williamson finally had the papers with his name, identifying him as the new owner of 125 Clay Street. The transfer of ownership came at the perfect time—one month later, and the church would have been lost to a wrecking ball. 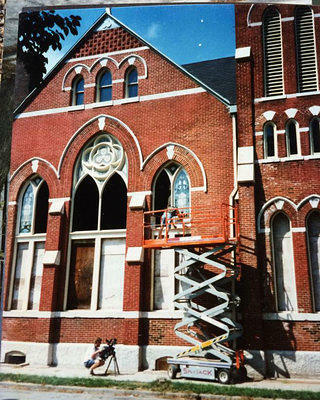 The stained glass windows were in poor condition when Williamson purchased the building. Photo taken in 1995. The Reformed Church was built in 1888. Williamson opened Urban Krag in 1996. 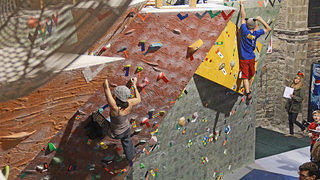 Ever since, it has catered to rock-climbers from teenagers to retirees of all levels. He remembers cleaning up the interior of the building and turning around to find strangers with a broom, eager to help out. Parishioners would seek him out to tell him how they were married in the church, or that their children were baptized inside. People would take off work to attend planning meetings in support of Williamson’s endeavor. “The energy is pretty much still here,” Williamson notes in reference to the communal atmosphere of the neighborhood. The example of Urban Krag aptly highlights the crux of the National Trust’s ReUrbanism initiative. Community interest, a building with deep roots, and a dynamic town were the perfect concoction for an adaptive reuse project. Urban Krag proves that giving new life to old buildings isn’t simply an ideal to strive for, but is a realistic goal that is transforming communities and proving preservation’s relevancy in vibrant, modern towns. “The maintenance is pretty much non-stop,” Williamson admits. However, the chance to climb the biggest wall in the state with stained glass windows as the backdrop is an opportunity that he, his neighbors, and visitors wouldn’t pass up. Urban Krag boasts the tallest wall in the state.